Emperor Kameyama (亀山天皇, Kameyama-tennō) (July 9, 1249 – October 4, 1305) was the 90th emperor of Japan, according to the traditional order of succession. His reign spanned the years from 1259 through 1274. 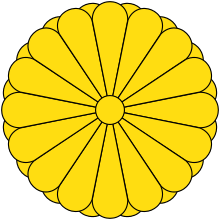 Before his ascension to the Chrysanthemum Throne, his personal name (his imina) was Tsunehito-shinnō (恒仁親王). The name Kameyama comes from the location of his tomb. In 1258, he became Crown Prince at age 9. 1259 (Shōgen 1, 11th month): In the 14th year of Go-Fukakusa-tennō 's reign (後深草天皇十四年), the emperor abdicated; and the succession (‘‘senso’’) was received by his younger brother. Shortly thereafter, Emperor Kameyama is said to have acceded to the throne (‘‘sokui’’). Statue of Emperor Kameyama located in Fukuoka, Japan. In 1263, during the Kamakura Rebellion, the 6th Shōgun, Imperial Prince Munetaka (eldest son of Emperor Go-Saga) was recalled from Kamakura to be replaced by his son Imperial Prince Koreyasu (age 2). In 1265 a Mongol delegation arrived from Kublai Khan, ruler of the Mongol Empire. On its way to Japan, they looted islands. The Mongols invited Japan to submit to the rule of Kublai. The Emperor and the Imperial Court suggested compromise, but they were ignored by the shogun in Kamakura. The Mogolian delegation was sent back. In 1274, abdicating to his son, Emperor Go-Uda, he began his reign as cloistered emperor. During his time as cloistered emperor, the Mongols invaded the second time. Kameyama personally prayed at the Grand Shrine of Ise. On August 15, 1281, Kameyama-Jokō asked for Amaterasu intervention on behalf of Japan. However, the Bakufu watched Kameyama with suspicion, and in 1287, encouraged Emperor Go-Uda to abdicate, and pushed for the enthronement of Emperor Go-Fukakusa's son, who became Emperor Fushimi. Kameyama's cloistered rule was suspended by this. 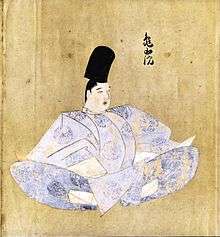 Later, Imperial Prince Hisa'aki, Emperor Go-Fukakusa's son, became Shōgun strengthening the position of the Jimyōin-tō. This caused Kameyama to become despondent, and in 1289 he entered the priesthood, joining the Zen sect. Because of this, Zen Buddhism slowly penetrated into the Court Nobility. In 1291, he helped establish the Buddhist temple Nanzen-ji in Kyōto. Memorial Shinto shrine and mausoleum honoring Emperor Kameyama. In 1305, he died. Emperor Kameyama is enshrined at Kameyama no Misasagi in Kyoto; and this Imperial mausoleum is maintained by the Imperial Household. The years of Kameyama's reign are more specifically identified by more than one era name or nengō. ↑ Titsingh, Isaac. (1834). Annales des empereurs du Japon, pp. 255–261; Varley, H. Paul. (1980). Jinnō Shōtōki. pp. 232–233. ↑ Titsingh, p. 265; Varley, p. 44; a distinct act of senso is unrecognized prior to Emperor Tenji; and all sovereigns except Jitō, Yōzei, Go-Toba, and Fushimi have senso and sokui in the same year until the reign of Emperor Go-Murakami. Varley, H. Paul (1980). Jinnō Shōtōki: A Chronicle of Gods and Sovereigns. New York: Columbia University Press. ISBN 978-0-231-04940-5. OCLC 914584.